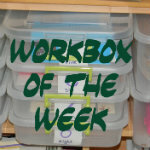 This week's workbox is super easy and has endless possibilities. I purchased one of those one-dollar little notebooks from the dollar section of a big box store like Target or JoAnn Fabrics. I placed it in the workbox and that was all. Margaret created the rest! Here is the notebook. Cheap and cute. Perfect for Margaret and for the Workboxes! "Your Grandmother is sick. You must go see her." "I will bake her some things." "Oh la. I am in the woods." "The wolf is in the woods." "Here is Grandmother lying in her bed." "The Wolf is at the door!" "Little Red Riding Hood is at the door!" And that's the end of her story. She likes to end it before anything happens.